W1-4 - Reverse Curve Warning Sign Left or Right Arrow - 24x24 - Official MUTCD Reflective Rust-Free Heavy Gauge High Intensity Prismatic Reflective Aluminum Road Signs with Anti-weather and Anti-graffiti protection Available. 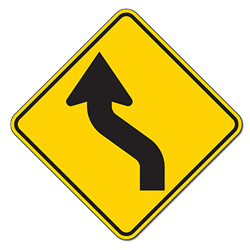 This sign meets Federal MUTCD W1-4 - Reverse Curve Warning Sign - 24x24 specifications. DOUBLE the working life of your Road Signs by adding 3M Protective Overlay Film (POF)! 3M’s high-tech POF protects sign faces against fading caused by the sun and harsh weather—and makes graffiti and sticker defacement damage easy to clear away without harsh abrasives.